The Assembly elections in J&K in 2008 was peaceful and witnessed record voter turnouts. In sharp contrast the very first day of the Lok Sabha Polls in 2009 witnessed an upsurge of Naxalite violence. There were 14 attacks that claimed 16 lives. Chhattisgarh and Jharkhand were the epicenter of the bulk of these attacks. However, what was of concern was the coordinated assault across the entire Red Corridor spanning Bihar, Orissa, AP and Maharashtra, in addition to the core areas of this virulent insurgency in Chhattisgarh and Jharkhand. 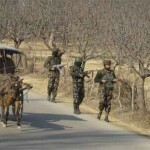 This tribal insurgency has overtaken both J&K and the Northeast in terms of the overall calculus of casualties and the threat it poses to India’s Internal Security. Lalgarh : Revival of the issue of tribal land, Lalgarh has now served to highlight this issue and accorded to it the degree of salience it deserves in our public discourse. This second phase of tribal angst is again rooted in the issues of land. This time the tribal alienation stems from acquisition of land for industrial projects/Special Economic Zones. The Maoists have leveraged upon this tribal grievance to rekindle the Naxalite rebellion in West Bengal. The problem however is that Lalgarh itself is not the key or core area of this insurgency. The prime areas of concern, are the core LWE affected states of Chhattisgarh and Jharkhand. The armed Naxal presence in Lalgarh is comparatively not as high as in the core states of Chhattisgarh and Jharkhand. Op Steeple Chase. Military history is a grossly neglected subject in this country. It would surprise many to be reminded that on 01 Jul 1971 the Indian Army had launched Operation Steeple Chase along with the Police to put down a Santhal tribal uprising in West Bengal. This was a culmination of the Naxalite movement that had begun in 1967 in Naxalbari. The Army had formed the outer cordon in Op Steeple Chase and the Police had gone in for the kill. Operation Steeple Chase ended by 15 Aug 1971 and broke the back of the first Naxalite upsurge in West Bengal. The Santhal tribesmen armed with bows, arrows, dahs and spears were no match for the fire power of the Army or Police. The plain terrain of West Bengal with its well developed network of road communications is not ideal guerilla country. Hence the first Naxalite uprising was easily crushed. It was fuelled by the tribal angst and anger that stemmed from a lack of land reforms. In the decades since, West Bengal and Kerala were two states that went the farthest to enforce land reforms. This, to a great extent, resolved the primary cause of the initial Naxalite rebellion and it withered away by the end of the 1970s. Terrain Shift. In the 1980s, the Peoples War Group (PWG) and Maoist Communist Centre (MCC) revived the Naxalite insurgency. They had learnt their lessons about the ideal terrain that would suit guerilla operations. They shifted the focus of the struggle to the densely forested and hilly tracts of Andhra Pradesh and Orissa. From insurgency in the plains (where it had no chance due to the mobility and fire power differential of the Security Forces), it became a jungle insurgency in classical guerilla terrain. The merger of the PWG and MCC into the CPI (Maoist) gave it an all India orientation. From just 09 States and 53 Districts in 2001, it has spread to 17 States and over 180 Districts in central and peninsular India. The core of this insurgency is in Chhattisgarh and Jharkhand. The Maoist had come to power through the ballot in Nepal after a decade long virtual civil war. Today the Naxalites in India talk of a Compact Revolutionary Zone or a Red Corridor that extends all the way from Pashupati in Nepal to Tirupati in peninsular India. It has over 10,000 armed cadres, some 15,000 assorted weapons (including 900 AK-47 Rifles, 200 Light Machine Guns and locally fabricated Rocket Launchers). Like the Maoists who gained power in Nepal, it has a Central Military Commission and Five Regional Bureaus. The Pakistani ISI has been making concerted attempts to forge linkages with it. It is one of the most dangerous threats to India’s National Security. However, despite the repeated warnings by the Prime Minister himself, it had generally not been recognized in the popular perception as a major threat to India’s National Security. Lalgarh hopefully, seems to be changing all that. The problem however is that Lalgarh itself is not the key or core area of this insurgency. The prime areas of concern, are the core LWE affected states of Chhattisgarh and Jharkhand. The armed Naxal presence in Lalgarh is comparatively not as high as in the core states of Chhattisgarh and Jharkhand. The armed Naxals in Lalgarh have rolled with the punch and melted away into the forests. So far the operations have generally taken the form of flag marches to reassert Govrnment control over areas from which the local administration had fled. The armed Naxals will bide their time to return once the additional forces deployed are withdrawn. The real areas of prime concern however are the core eight districts in Chhattisgarh, Jharkhand, Orissa and Bihar. Excessive media hype about Lalgarh should not detract from this operational core of the problem. Demography is a key subject that is largely overlooked in our security analyses. 62 percent of India’s population is in the working age group. The bulk of it resides in the villages. By 2026 this youth bulge would grow to 68.8 percent of a population of 1.4 billion. By 2026 India will have the most youthful population in the world. This would translate into almost a billion people who would need jobs. What will happen if the state fails to generate this many jobs? The internal–security consequences of such a failure could be dismal. 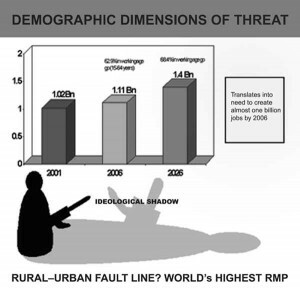 This demographic bulge in turn could generate a major rural–urban fault line in India. The primary manifestation of this today is in the Left Wing Extremism (LWE) that is sweeping through the tribal regions of central and peninsular India. As stated, Naxalism had started as an agrarian rebellion by the Santhal tribals of Naxalbari in West Bengal in the year 1967. Ruthless attempts by the state to stamp it out have failed as the state has exhibited the lack of a political will to effect agrarian reforms. After initial setbacks, this insurgency resurfaced in the 1980s with the rise of the People’s War Group (PWG) and the Maoist Communist Centre (MCC). In 2004 the PWG and MCC had merged to form the CPI (Maoists). This has given a pan-India orientation to LWE. The spatial growth of the LWE has thereafter been dramatic and alarming. Large scale displacement of tribal populations by major hydro-electric projects and extensive mining in jungle areas has led to the current third phase of the LWE. The core of the insurgency is focused in Chhattisgarh (Abujmar Region) and Jharkhand, with significant activity levels in Bihar, Andhra Pradesh, Maharashtra and Orissa.Casualty Ratios. What is becoming a cause for alarm is the adverse tactical exchange rate or casualty ratio between the Police/Central Police Organizations (CPOs) and the Naxals. This had ranged between a not very reassuring 1:1.4 to 1:2 between 1999 and 2006. However in the year 2007 and 2008 this ratio has become adverse and tilted in favor of the Left Wing insurgents. Despite all the attempts at the modernization and training of the police and their expansion by some three lakhs, the situation in 2009 has taken a turn for the worse. The number of police and Central Paramilitary Force casualties has already crossed 200. The casualty ratio has further worsened to almost 2:1 in favor of the Naxals. It may be noted that the casualty ratio between the Indian Army and the terrorists in J&K was of the order of 3 or 4 is to 1. When it reached the figure of 5:1 in 2005, there was a visible improvement in the situation and the back of this movement was broken. Casualty ratios therefore are a highly critical parameter that merits very close monitoring. Calling them names won’t help, I guess. We cannot eeitrmxnate a group of people because they are violent. First off, we are not capable of doing that. Secondly, there are more sane solutions to every problem. What we’ve got to do in the long term is to understand the causes of the birth of a terrorist. And terrorist means everybody who terrorizes by mass destruction and violence.